Experience a system of health care that focuses on the innate knowledge that your body possesses. As chiropractors, Dr. Donohoe and Dr. Wilder concentrate on restoring and removing any roadblocks to this inborn intelligence, returning your body to a state of balance so it can function at an optimal level. We seek to educate our patients about the vertebral subluxation complex. The chiropractic adjustment corrects the subluxation, which is a loss of the proper position of any joint in the body. We’ll make sure that you understand exactly what we’re doing, why and how a subluxation negatively affects your central nervous system. In turn, it can have far-reaching effects on your health and wellness. The adjustment will stimulate your nervous system to function at a higher level, which will then allow your whole body to heal. If you visit our office due to experiencing pain, we focus on providing acute care to get control of your discomfort. Next, you’ll enter a phase of corrective care where you’ll heal, recover and stabilize. These visits are less frequent. When your pain has been addressed and your lifestyle optimized, you can enter wellness care to maintain your health. 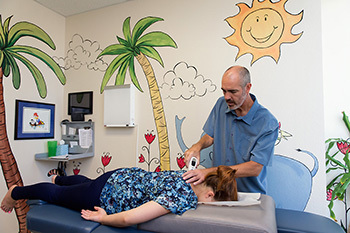 There are two primary methods used for chiropractic adjustments at Donohoe Chiropractic. Both involve a soft touch and are extremely specific. Activator Methods® utilizes leg length analysis combined with instrument adjustments, given with the latest device on the market. An electronic impulse triggers a mechanical thrust. It’s ideal for the spine, extremities and any structural dysfunction. Neuro Cranial Integration, or NCi, is another painless technique that employs a two-stretch procedure to release tension inside your cranium and spine. It takes just a couple of minutes and complements the instrument adjustment. Experience the many benefits of chiropractic care. Contact us today! Convenient Saturday appointments are available.